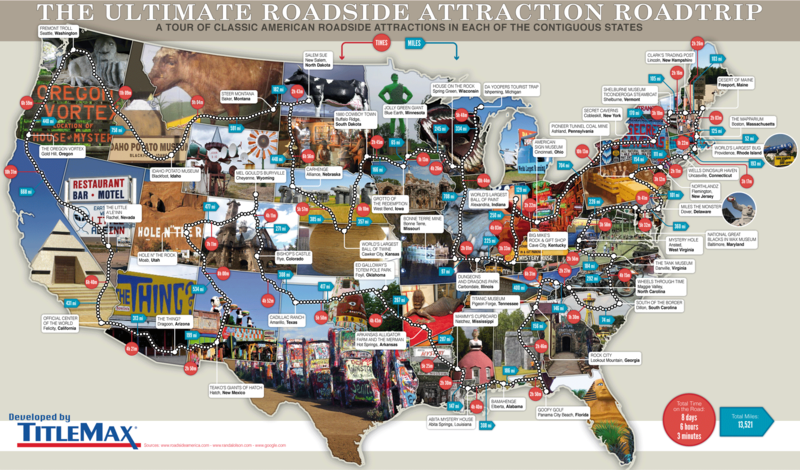 The Ultimate Roadside Attraction Roadtrip #Infographic ~ Visualistan '+g+"
Imagine you're taking an extended road trip across the country with your family. You'll be crossing three rivers, passing through six states and countless cities. The drive is going to take forever; this car is going to become your new home. Surely you'll run out of audio books, video games, and other activities in the car. And if you're driving, what then? This is where tourist traps and as we more lovingly call them, roadside attractions come in. On every long stretch of road in the middle of nowhere, you can count on hard working Americans and the businesses they've set up along the road to give you some entertainment, sell you some souvenirs, and most importantly, take your mind off the road for a little while. Sure you'll be spending some extra money when you stop, but how much is a quirky and fun experience worth? Whether it's something silly like the biggest ball of twine in the world, or something terrifying and mysterious like "The Thing! ", there's always something new to see or something new to learn about around every corner. 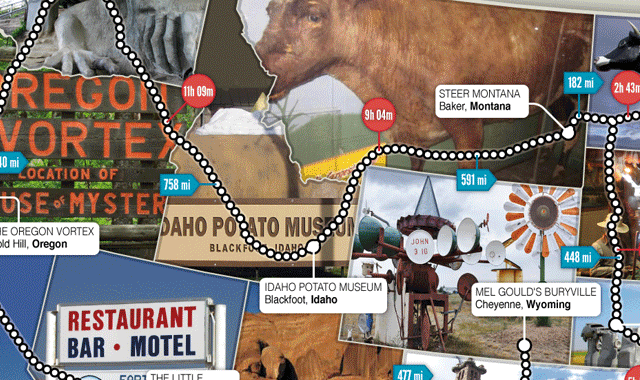 This infographic, from the title loan professionals at TitleMax.com, showcases 48 roadside attractions (one in each contiguous state) and how long it would take to drive between all of them in one road trip!